The boys set off for the Henley Royal Regatta and make teatime treats including a victoria sandwich and cookies with sour cherries and chocolate chips. Browse content similar to Teatime Treats. Check below for episodes and series from the same categories and more! Are we ready for another two-wheeled adventure, mate? Ready? I'm ready for a cuppa. Well, we're heading for the right place, then. Let's bake up a proper tea. Ooh! Going posh, then, are we? I need to dust off my blazer and boater. and put out a fancy tea for the guys from the Tees Rowing Club. That's my neck of the woods, that. It's a tea-time treat to end all treats. It's a tea-time treat for toffs. Here, baking is practised to benchmark perfection. If you've not made it this way before, we're going to weigh the eggs in their shells. Dude, she's weighing her eggs. That's a worry. will weigh exactly the same. She's only got four. We've got seven in ours. Ours'll be richer, it works. and dusted off with castor sugar, never icing sugar. Tough bunch of ladies, these, for a couple of free form bakers like us. Victoria sandwich with a few naughty extras. Well, nothing I thought we'd get a black mark for. Here we go, step one. Sugar, butter, unsalted. Loads of it. Just start off nice and gently and what we're looking for, it needs to go pale. It needs to go virtually white. It's gone white, like a polar bear's bum. By using seven eggs, naughtier but nice. Just to give it a bit more flavour. I've got some vanilla extract. Just whisk this in. Nobody'll know. you kind of love it, don't you? You take it and possess it. It's lovely. -Never let me down yet. -Right, we need to make our butter cream cinnamon icing. Butter cream icing. Icing sugar. Half a pack of butter. We're doing this which is dead cheeky. We're putting some cinnamon in, it's great. Like passion cake, it's got that cinnamon butter cream icing. It's not strictly right, but it's dead tasty. -Right, lads, how you getting on...? Smashing, the cakes are in and it's gone perfectly fine. Yeah. We're ready, we're ready. -We'll be jamming up later when the sponges come out. Whoo! Bob Marley. We're jamming. Yes! Absolutely perfect. Look at them. makes the grade for judge Jill. big and fluffy and gorgeous. Ours is like a carpet tile. Now on with the butter icing. Go on, layer it up. Ours has got cream in it. You're not supposed to tell the judge what's in it. Kingy, the only judge you ever spoke to has been behind a bench. Don't worry, Dave, I've got this judge wrapped round my little finger. So, what's the verdict on our hairy Victoria sandwich with cinnamon butter cream? You've given me a problem, you two. Well, this cake is not according to schedule. -It was. Aye, what's the matter? It's not a Victoria sandwich. But as a cake, it's lovely. With that lovely cinnamon flavour. Because it's got the added extras. Perhaps, you know, if you renamed it or something. Love you. I quite like that. You haven't finished yours. What's the matter with it? Rah! Disqualified for a layer of butter cream. I think Si and I could pedal our bikes to Henley. the Tees Rowing Club from Si's neck of the woods. They'll need some feeding up. They're doing all right, the Geordies. They're not Geordies, man, they're Teesiders. Whatever, northerners. They think the chip shop's shutting, they're putting a spurt on. -Go on, boys, go on. -The Post Office must be open for their grants. Come on, lads, we've got better pies up north. Come on! Apparently, the Teesiders have reduced the stroke. To half a length. Don't understand lengths. I've got no idea at all what's going on. You just have to dress up as a berk and bake cakes. This rowing lark's a whole new world for Dave and me. and takes seven minutes to cover. to our afternoon tea for the rowers. Ooh hoo! Our tea-time table treats is building up bazonkers. -I've just chopped this chocolate. Nice and chunky. Nice white chocolate, lovely dark chocolate. That's not cheap chocolate, is it? That's proper chocolate. You need posh chocolate for our cookies. these super-chewy sour cherry cookies are at the other. These are an opulent cookie, the big one. The basis to any good cookie or cake is our sugars. -It's creaming your fat with your sugar. to go into the golden castor. Between you and me, the secret to super-chewy cookies is oil. The sort that are cooked but they're still a bit soft. nice and pure, into the mixture. It should cream slightly easier, actually, with the oil in it. You know...it's a tea-time treat to end all treats. Now these are dried soured cherries. To drain these, I just hope it doesn't splash on me flannels. a splash of good, French cherry brandy. Look at that. Go on, go on, don't be shy. Now...whip those into your dough. Next ingredient is a handful of slivered almonds. And now some chopped hazelnuts. Don't forget my chocolate chopping board. Now, this has to be the most luscious dough on the planet. Roll it out about a centimetre thick. Keep it quite thick cos when they bake, they'll spread. they'll come out bigger, they'll come out like soup plates. But we're at Henley, so we want quite dainty ones. We use a glass because it's nice and there's one to hand always. And just pop 'em out with this. you can put them said cookies on 'ere. Two trays of perfectly-formed cookies. There we are. To the fiery furnace. We've got to get a move on, Kingy, because the rowers are coming over in a minute. Thing is here at Henley, they pause for tea. They don't "take tea", they "pause" for tea. Did your mam used to call you in? Come on, your tea's ready. The 60,000 million dollar question. Tees rowing club, did you win? -There you are, look at that. So, do you lads have a special diet? Do you have to watch the calories? Or do you just go for it and bulk up weight? Thankfully, I fall into the heavyweight category where you try and eat as much as you can. -6,000, 7,000 calories a day. So, plenty of cream, anything rich. 6,000 or 7,000 calories a day? Body's a temple, dude, body's a temple. Yeah, that's what we do, but you've got to go rowing to get rid of it. We should do that. We could be like this. It's not too late. All this whingeing on about rowing, I don't know what the problem is. Nor me. Look, get an engine. Then you really can have your cake and eat it. It's hard work when you're cox-less. Oh, tell you what. Does this join on to the Tyne? When it comes to afternoon tea, the British like nothing more than a sweet treat to go with it. 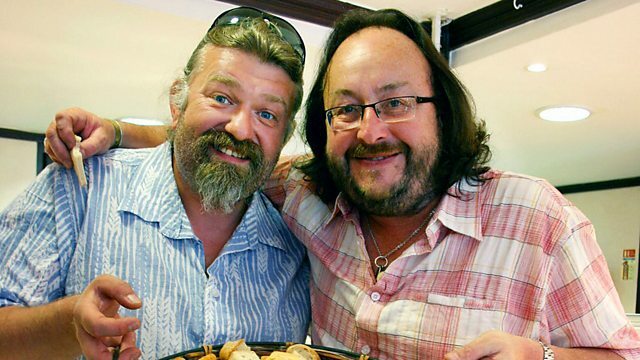 The Hairy Bikers, Dave and Si, set off for the Henley Royal Regatta, and on their journey they fill their hampers with cakes and treats made along the way. In search of tips on how to make the perfect victoria sandwich, the boys visit the Women's Institute and bake their own version, but will it satisfy the judges' criteria? Finally, the boys hit Henley and make chewy posh cookies with sour cherries and chocolate chips. They serve afternoon tea to the rowers from Tees Rowing Club, before taking to the water themselves.